It's a bird! It's a plane! No, it's an Amazon warehouse. 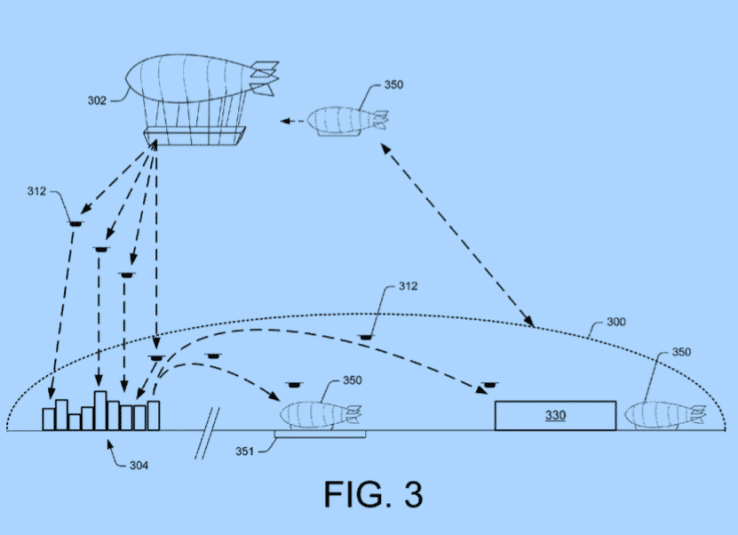 Amazon has filed a patent that sheds light on its future drone-powered distribution plans, and they include an airship full of merchandise. We’ve long known that the company was extremely interested in deliveries carried out by drones, but these plans uncover just how far ahead the online retail giant is looking to see their vision through. Central to Amazon’s plans is the deployment of “air fulfillment centers (AFCs),” each acting as a sort of flying warehouse. These AFCs would hover over areas where demand is expected to increase for certain products at a certain time. For example, during a sporting event, they might hover above the stadium while stocked with snacks or team merchandise. Upon receiving an online order, smaller drones aboard the AFC would fly down to the stadium and deploy the demanded goods to the customers — a quick, convenient delivery. The AFC might even descend from time to time to flash a video or blare out an audio advertisement. Though it seems relatively simple, the whole process actually involves a complex web of people and aircraft. Amazon’s patent mentions additional auxiliary aerial shuttles that occasionally restock the AFCs, as well as bring the drones back up, as the company wants to save their power for deliveries. Also brought up in the patent was the idea of the drones and shuttles “talking” to each other, communicating crucial information like atmospheric conditions and quickest routes. Though the idea of receiving a product just minutes after ordering it online, even when you aren’t at home, is thoroughly exciting, we might have to temper our expectations. Given that these airborne fulfillment centers involve a considerable number of things flying around, Amazon has quite a few regulatory obstacles to overcome before it can put this plan into action. Although the first delivery by drone in the U.K. was a success and 7-Eleven has completed a full month of drone deliveries in the U.S., the whole process is still in development, both legally and technologically. Not all patents are seen through to reality, but should this one materialize, we might have just had our first peek at the future of retail.